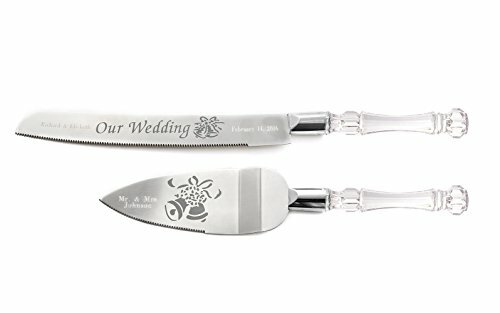 Please view Sample Image: Engraved wedding cake serving set can be personalized with Couple Last name and wedding date on Knife and Last name on Server. ***Engraved items are NON-REFUNDABLE, NON-EXCHANGEABLE, so make sure your message is spelled correctly before submitting. ** Please note: Space is limited due to "Our Wedding with Bells" Image on knife and Wedding Bells Image on Server cannot be changed. If you have any questions about this product by THE ICE EMPIRE JEWELRY, LLC, contact us by completing and submitting the form below. If you are looking for a specif part number, please include it with your message.